Senior captain leaves as program's scoring leader among defensemen. With six minutes left in regulation and his team trailing by a goal, Waterville senior defenseman Andrew Roderigue transformed from a truly great player into a generational talent. Roderigue took over at both ends of the ice, tied the Class B North championship game against Old Town/Orono before regulation was out and set up the game-winner in overtime, helping secure a regional title for the Purple Panthers. Four days later, Roderigue helped the Panthers win their second consecutive Class B state crown. Cony: Logan Leadbetter; Gardiner: Tristan Hebert, Hunter Russell, Ryan Kelley; Lawrence/Skowhegan: Curtis Martin; Messalonskee: Tyler Lewis, Connor Smith: Winslow: Tommy Tibbetts, Logan Denis; Maranacook/Winthrop: Matt Ingram, Daniel Shea; Waterville: Michael Bolduc, Nathan Pinnette, Zach Smith, Cody Pellerin, Zach Menoudarakos; Winslow/Gardiner (girls): Evelyn Hinkley, Julia Hinkley, Sarah Morgan. For his efforts, Roderigue is the Morning Sentinel Hockey Player of the Year. Waterville teammates Justin Wentworth and Jackson Aldrich were also considered. But it wasn’t merely the penultimate game of his senior season that earned the defenseman Player of the Year distinction. Roderigue scored 19 goals and finished with 53 points in 21 games, including the playoffs, leading all defensemen in Maine high school hockey in scoring this season, Class A or B. 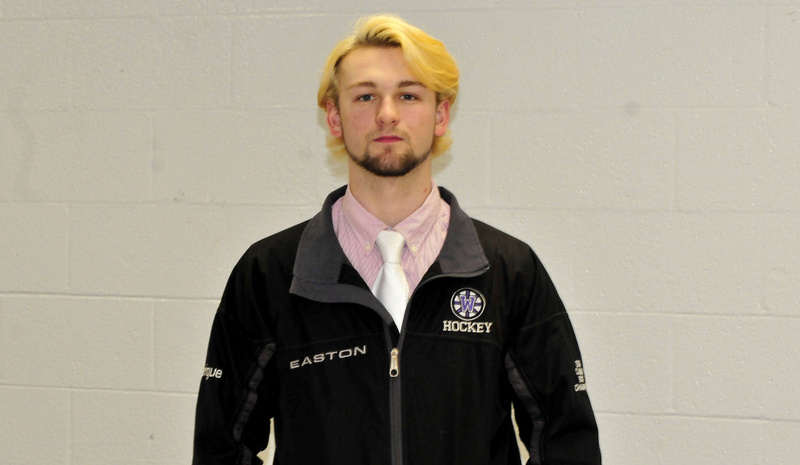 In December, with a six-point performance against rival Winslow, he broke the school’s all-time scoring record for defensemen and finished with 144 points in his career at Waterville. Roderigue, the true definition of an offensive defenseman, took over games at both ends of the rink, much as he did in the final minutes of the regional final against the Black Bears. He leaves the Waterville program on the heels of back-to-back state championships, the first Purple Panther team to win two in a row since the 1980-81 seasons. On a team that averaged nearly 10 goals a game, adversity wasn’t something it encountered often, so Roderigue made sure the team could lean on him when those situations would arise for his team. Becoming a leader — a vocal one at that — was challenging for Roderigue. While the on-ice part of the game came naturally to him, the off-ice part was something he had to learn. That energy is one of the reasons Roderigue, who is still choosing between junior hockey or prep school next year, has always been a defenseman growing up in the game. Vision, it turns out, is one of Roderigue’s greatest assets — right there with his speed, puck movement and heavy left-handed shot. Undersized for a traditional defenseman at just 5-foot-7, he still uses his hockey smarts to play a more physical game than most would expect.